These leg warmers knit up fast and are cute to boot–a great addition to your little one's dance ensemble or adorably stylish winter outfit! They're also cute when flipped upside down and tucked into boots with the ruffle peeking out the tops. 5 stitches and 7 rows per inch in Stockinette Stitch. Note: Baby and child leg sizes are highly variable and there is no standard sizing for them. Please be sure to refer to the circumference and lengths given when you choose a size, not just the age. Also, the length can be altered easily by changing the amount of Stockinette Stitch you do in the middle of the leg warmer before you get to the ankle decreases. Cast on 28 (32, 36, 40, 40, 44, 44) stitches and join in round, being careful not to twist. Work in 2x2 ribbing for 1 inch. Next round increase: *K7 (8, 9, 10, 10, 11, 11), m1. Repeat from * across round. 32 (36, 40, 44, 44, 48, 48) stitches. 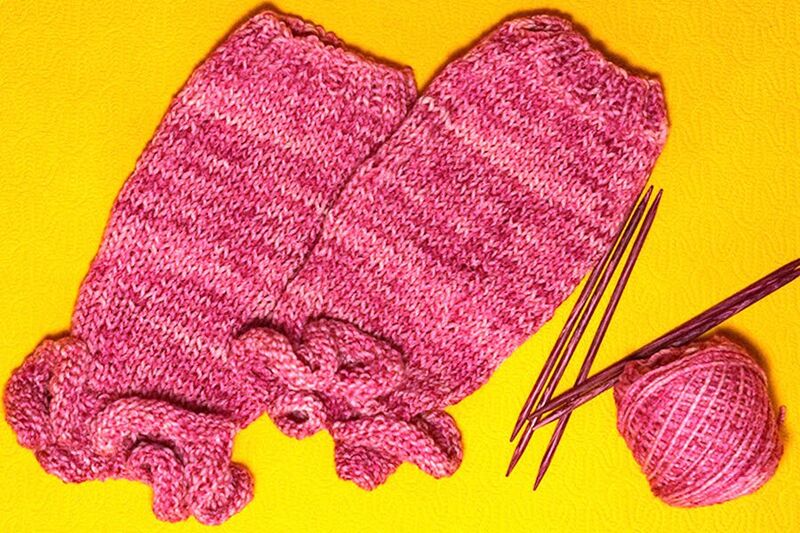 Work in Stockinette Stitch (every round knit) for 1.5 (2.5, 3, 4, 4.5, 5, 5.5) inches. Next round: *K6 (7, 8, 9, 9, 10, 10), k2tog. Repeat from * across round. 28 (32, 36, 40, 40, 44, 44) stitches. Knit 1 inch for all sizes. Next round: *K5 (6, 7, 8, 8, 9, 9), k2tog. Repeat from * across round. 24 (28, 32, 36, 36, 40, 40) stitches. Next round: *K4 (5, 6, 7, 7, 8, 8), k2tog. Repeat from * across round. 20 (24, 28, 32, 32, 36, 36) stitches. Work in 1x1 ribbing for 0.5 inches. Kfb in every stitch across round. 40 (48, 56, 64, 64, 72, 72) stitches. Kfb in every stitch across entire round. 80 (96, 112, 128, 128, 144, 144) stitches. Bind off using the Stretchy Bind Off. Make the second leg warmer in the same fashion as the first, following the above instructions. These make a great holiday or birthday gift for kids and young dancers.